Santa Claus (and snow) is coming to town! 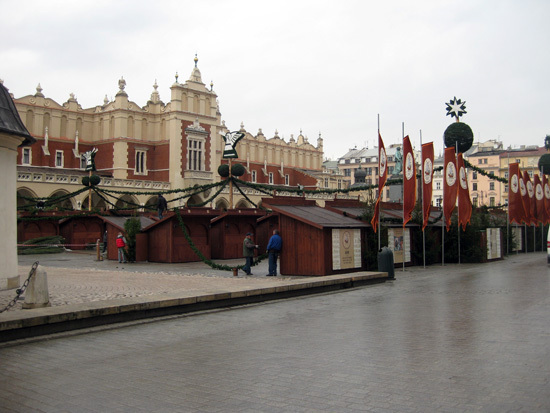 This is a photo I took yesterday of the Rynek Główny, Kraków’s Main Square, yesterday. At the moment, there are lots of workmen around the Sukienniece, which is the awesome 14th century building you can see at the back of the picture, assembling little wooden carts for the famed Christmas Market and putting up decorations befitting the season. I really don’t think I have EVER been this excited about Christmas before, even when I was young. My friends here, who are all from Europe and America, don’t quite understand why I’m looking forward to it so much. My idea of Christmas is radically different to theirs – it usually involves sitting in shorts and a t-shirt drinking beer in a relative’s backyard, eating salad because it’s too hot for anything else and repeating this the next day while watching the Boxing Day Test. As much as I love Christmas at home with my family and my friends, it feels like this Christmas season is going to be my first real Christmas, the first Christmas where the ideas and traditions match the reality of the event. The food and drinks, the Christmas carols, the typical images of Christmas we’re bombarded with… this year, I’m actually going to see that unfolding in front of me instead of noting the absurdity of my aunty humming ‘Let it Snow’ when it’s 30+ degrees and humid outside. And, honestly, I can hardly contain my excitement about the prospect of mulled wine, Christmas markets and making snow angels during the silly season. Does anyone else who is on exchange in Europe feel this way too? This entry was posted on November 23, 2010 by lucychapman. It was filed under Festive season, Poland and was tagged with Christmas. I’m definitely feeling the excitement for this christmas also!! I’m in Bath in the UK, and they’ve just had a massive ceremony to turn on the christmas lights around town. Christmas markets are also being set up. And all my english mates are getting soo excited when I tell them i’ve never had a christmas below 30 degrees. I’m heading to a friend’s house for christmas, an her whole family is so excited to give me my firs ‘ real’ christmas, they’re pulling out all the traditions.